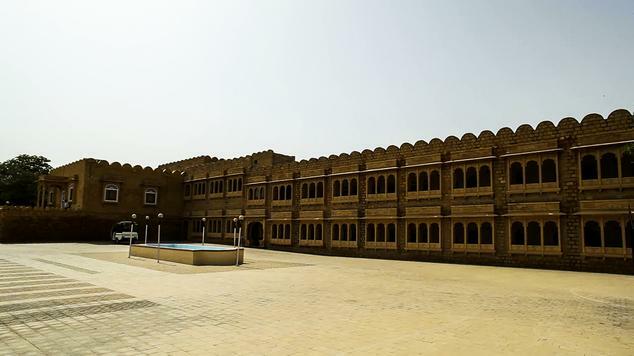 Idyllically set in the desolate Thar Desert of Rajasthan, the Himmatgarh palace is a contrasting evidence of the comforts of the Royalty with its modern facilities set in the old heritage monument –of- a- hotel, carved in yellow sandstone. 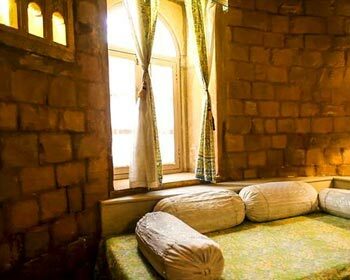 Truly a blast from the past, the ambience of the hotel and its surroundings will transport you back to the time of the royals. 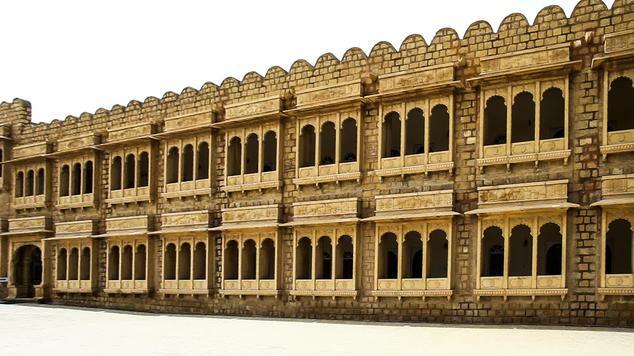 Within kilometers away from the airport, railway station and the bus stand the hotel is right across the sunset point in Jaisalmer and gives a great view of the fort of Jaisalmer. 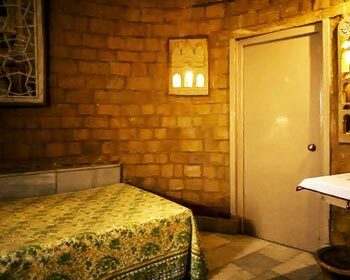 The hotel itself has all the modern amenities for a comfortable stay with impeccable room service. 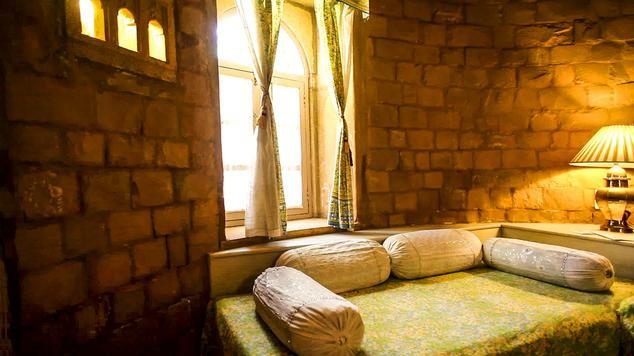 These rooms are spacious in size and come equipped with a double or twin beds. The view of the sand dunes from the room is spectacular. 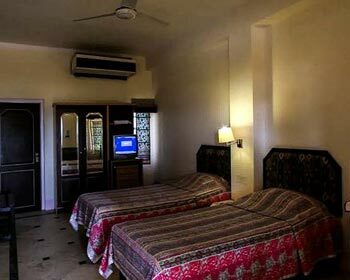 The room itself boasts of impeccable room service, 24hrs of laundry service, telephone with direct dialing, cable television with satellite channels and an attached bathroom with western style facilities. 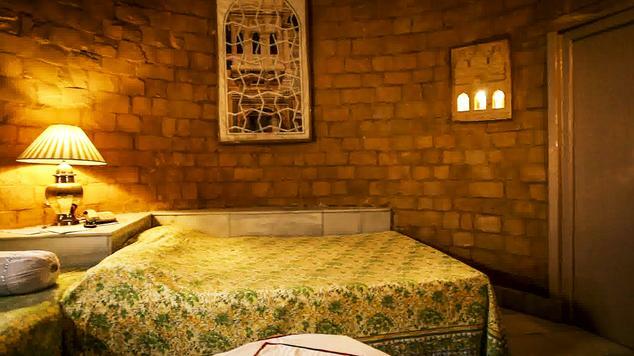 Slightly larger than the standard rooms, these rooms are fully air conditioned and come with all the modern amenities of a telephone with direct dial service, a queen sized/twin beds, laundry service, cable television with satellite channels and an attached bathroom with all the elemental toiletries. 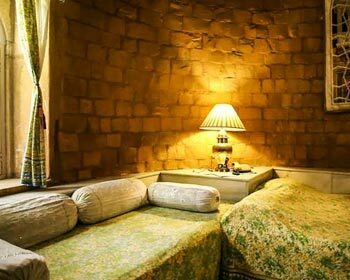 Like deluxe rooms, these rooms are spacious enough to give the guests all the comforts of a good hotel. 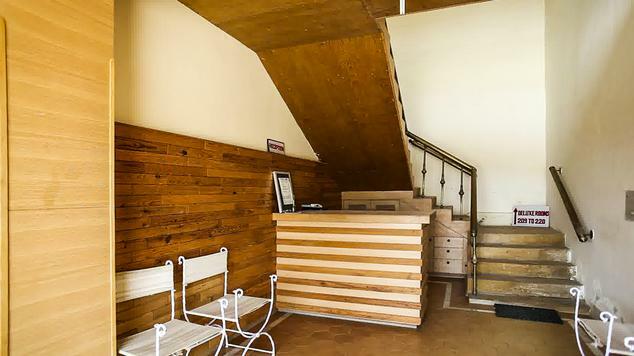 Stylishly decorated in contemporary décor, the room is fully equipped with a king sized bed/twin beds, cable television with satellite channels, a sitting area in the room itself, telephone with direct dial service and an en-suite bathroom with all the modern facilities. 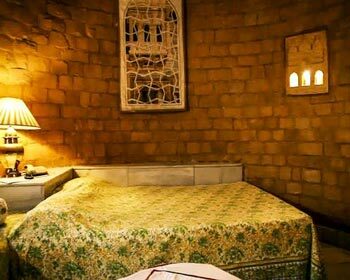 specially designed for the single travel the room comes fully air conditioned with a single bed with the option of an extra bed on payment. 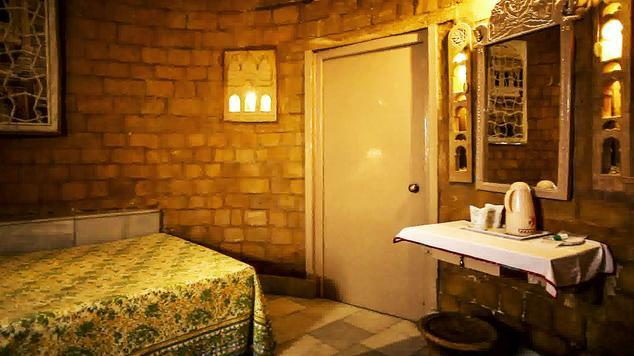 The room is stylishly decorated in shades of Rajasthan and has all the modern amenities like a color television with satellite channel, telephone with direct dial service and an attached western style bathroom for a comfortable stay. For a majestic feel, this spacious suite style room is perfect for a larger family. 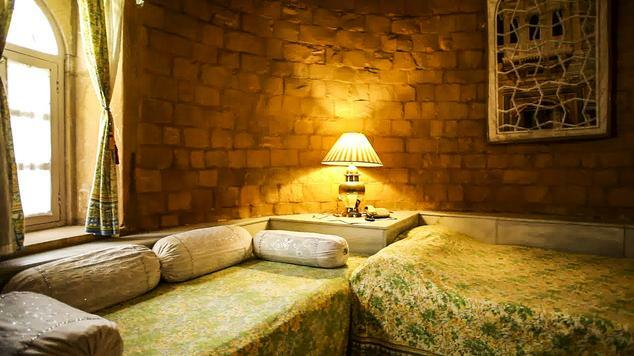 Equipped with a comfortable king sized bed with extra bedding on additional charges the room is fully equipped with an air conditioner, satellite television, a separate sitting area, telephone with direct dial services, laundry service and an impeccable 24hr room service. 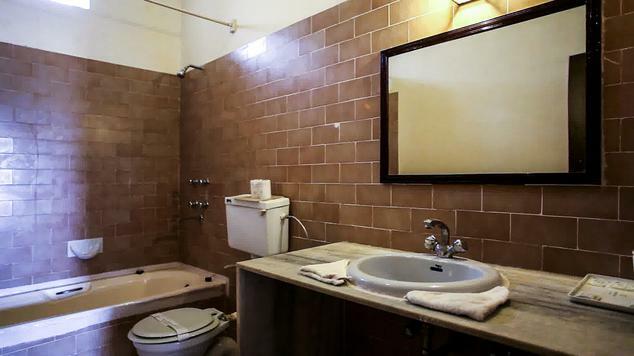 The western styled bathrooms are well equipped with modern fittings and are spacious in size. 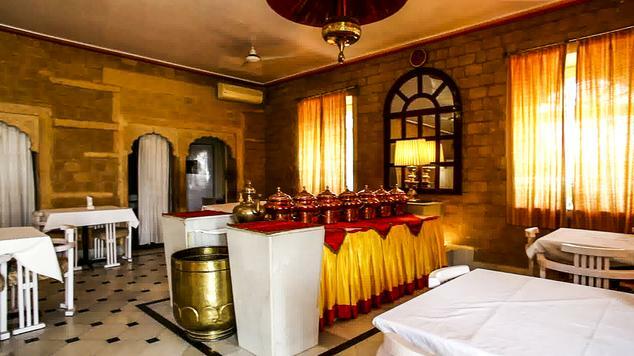 The restaurant s traditionally decorated in the colors of Rajasthan and welcomes the guests in a majestic style which is true to the image of the hotel itself. The food is delicious and mouth watering with the choicest dishes on the menu in Continental and Indian varieties. 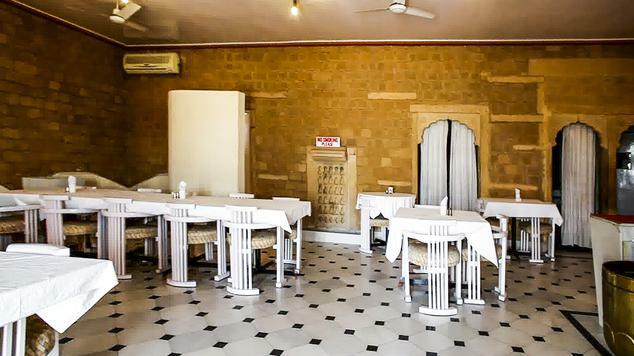 The restaurant also serves a range of traditional Rajasthani dishes for its guests who feel like having a taste of Rajasthan. 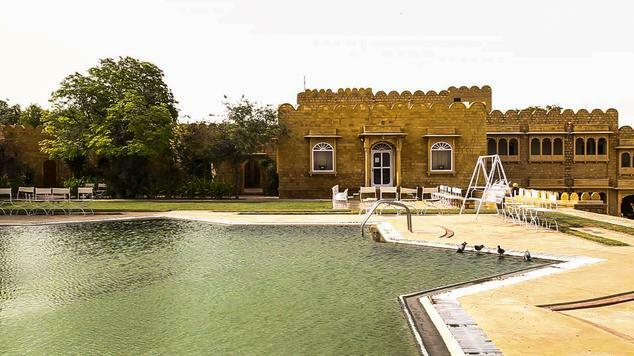 The bar is situated on the terrace providing a great view of the sunset in the sand dunes on one side and the Jaisalmer fort turning liquid gold in that sunset on the other side. With such breath taking views, enjoy the refreshing beverages on service with a menu that boasts of the choicest of spirits from cocktails to mocktails.